The Catholic Church and the Sacraments basically do not appear in this alleged book of Catholic spirituality. It seemed to me a spiritual-not-religious book. With a new lens, women also began to see the divine within nature, the value and importance of the cosmos, and that the emerging new cosmology encouraged their spirituality and fed their souls. One sister described it, “I was rooted in the story of Jesus, and it remains at my core, but I’ve also moved beyond Jesus.” The Jesus narrative is not the only or most important narrative for these women. 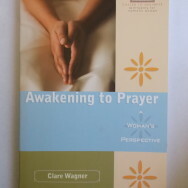 The book series of which Awakening to Prayer is a part was created with funding from “an organization of philanthropists: Foundations and Donors Interested in Catholic Activities (FADICA)” in response to “[t]he need for a creative, solidly grounded, and theologically sophisticated spirituality available in an accessible form for all Christian women.” Series editor Elizabeth Dryer (whom a Sinsinawa Dominican calls “a former member of ‘our crowd'”) says “the time is ripe for ‘ordinary’ women to be doing theology,” and speaks in feminist language of younger women readers “likely to be already grooming the soil for a fourth wave of Christian spirituality done by and for women,” though she is concerned that young women my age are unaware of past efforts to secure women’s dignity. Speaking for myself, I am aware, appreciative of what is good, but feel there have been very harmful excesses, such as feminist individuals “doing theology” by novel, questionable methodologies and without assent to Catholic teaching, resulting in large numbers of them now in painful angst as a result of their new and different belief system putting them in conflict with “the institutional Church”, as the Sinsinawa Dominicans put it. Sister Clare Wagner writes that she has “found it enlivening and engaging to realize that at this moment of enormous change, rapid technological advancement and a new relationship between faith and science, we are called upon to see prayer, too, in new, creative ways.” It’s not clear to me why this would really change prayer, and I don’t think she means that sometimes people use a smartphone app to pray the breviary, so I suspect she sees herself crafting a spirituality that corresponds to a changed theology. The text gives a lot of evidence of that. The Divine Spirit is and has been living and moving in continuously new ways for billions of years in this universe. To pay attention to this movement now is to embrace an evolutionary perspective…. Each of us is a microcosm of the evolutionary process of the entire universe. the prevalent image of God was that of a sovereign male demanding and distant, possibly frightening and judgmental, definitely patriarchal…. In a system where the “rules” say that spirit is valued over matter, humanity over nature, heaven over earth, soul over body, and man over woman, it is nearly impossible to celebrate equality and thirst for relationship with a God who reigns supreme over all of it. Purely on the level of friendship this is fine! Absolutizing this way of thinking has led the Sinsinawa Dominicans to alter their understanding and practices of religious obedience in ways that seem to have put them at odds with the Church’s canonical requirements for governance of religious life. And the attempt to implement a “non-hierarchical” vision for the Church through democratically deciding things like doctrine, morality, and Church discipline is the concept behind the destructive change-the-Church group Call to Action, of which Sister Clare is a member. Though Jesus knew the Jewish law and the prophets well, his confidence, authority, and belief that he could make a difference were rooted in his Abba experience. This encounter with loving Divine Presence and the relationship with Abba that followed provided the foundation for his spiritual life. The most poignant thing in Awakening to Prayer, is from the end-of-chapter ritual for Chapter 4. We are to “[g]ather a candle, a small box with a lid, a pen, five or six small strips of paper and a dish with water in it. Arrange these items into a beautiful altar that represents struggle.” We are to do some activities with these items, finally we sprinkle some water on these items and “Make the Sign of the Cross on yourself with this water.” That is the most poignant thing, to me: a lonely ceremony with pretend Holy Water, for a spirituality seemingly without priest or Church. I find Sister Clare human, warm and likeable, which all the more leaves me with sadness. Everything in Awakening to Prayer is kept vague enough and sounds enough like Catholic teaching on prayer, that apparently it slips by at a diverse publisher like Saint Anthony Messenger Press, with words on the cover stating it to be “spirituality for catholic women.” But behind this “emerging spirituality” lies an “emerging theology”, that I feel concerned seems to leave the Catholic Church behind.